The other day I asked Hubby if normal three year olds acted like P’Diddy does. He replied that if they have big brothers they do! Wow some of the things he already knows and the words that come out of his mouth. Some of it is impressive. 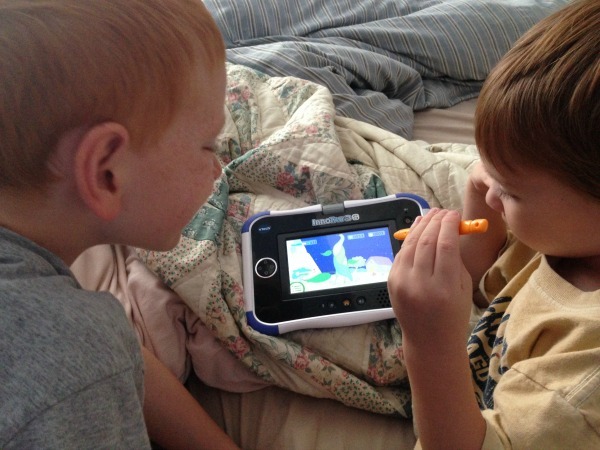 Like how he whips out his ear phones and plugs them into this new VTech InnoTab 3S and gets busy coloring a picture. Or changes cartridges to start a new game. One day I tried to help him to get out of a program by blinding pushing buttons and he says to me – No Mom do it this way! This tablet is very sophisticated and can do all sorts of big boy activities – take photos and video with the rotating camera, has an MP3 player for music, downloads ebooks and coolest feature of all – a Connect Center to send text messages! Right to MY smartphone. P’Diddy of course can’t type words so he uses the features to send me picture texts. Hearts that verbally say I love You or a smiley face that says Hello. It is fun for him! Even his brothers are a bit jealous of this feature. The InnoTab 3S also comes with 20 free apps, including a magical beanstalk growing game; a directional pad game, H2O Go!, that teaches science concepts through an animated drop of water; and a pop-up 3D art studio so kids can explore their creative side. More creativity can be found in the WonderCam app, which lets kids add more than 55 special effects, funny faces and photo frames to their pictures. Plus don’t forget about the cartridges (like Dora the Explorer, Disney, Thomas and Friends, etc) and ebooks/apps from the Learning Lodge you can buy to add on to your InnoTab 3S. There really is endless activities and should keep them busy for a long time! Also want to tell you about my favorite new feature ~ the rechargeable battery pack with AC adapter. I hate buying batteries that wear out fast. This is an awesome plus! All of these features for $99! Not bad right? Find the InnoTab 3S on Amazon and other retail stores. 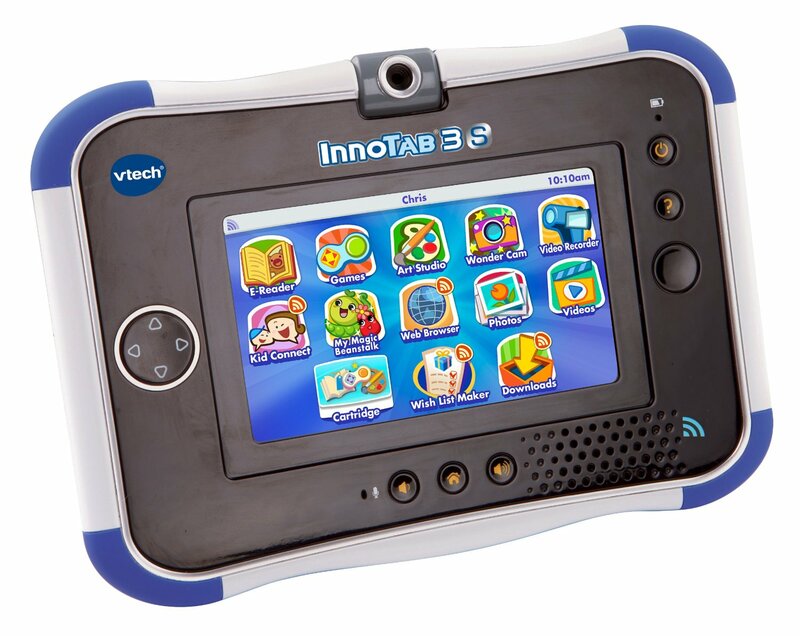 WIN a VTech InnoTab 3S Learning Wi-Fi Tablet! All Amazon links are affiliate. Thank you for supporting this blog! I received these items for free for review and all opinions are my own. This giveaway will end on October 14, 2013 at midnight EST. Winners will be drawn via rafflecopter. Once a winner is drawn I will contact them and they will have 48 hours to reply before I draw a new winner. Giveaway is open to anyone in US and you must be 18 years of age or older. Giveaway not affiliated with Facebook & I release them of liability. Winner will be posted in the rafflecopter widget. I like the 180 degree camera! I like that the InnoTab 3S also comes with 20 free apps. I like that it has a camera, my son takes tons of pictures with our phones- he's 2. I like that it comes with so many pre-loaded 'kid friendly' apps. I like the camera feature. I just love these! I love the idea of introducing young kids to using tech in a safe and kid-friendly way. I like the camera the best. I was happy to read that it has a rechargeable battery pack. That is so handy on these types of devices. I like that it is so durable for those little hands. Love the fact it has 20 free apps! I love that it has a camera. Thanks so much. My niece will love the camera feature! My daughter has wanted a tablet and I like this has wi-fi and 20 apps already installed. I like the rechargeable battery pack, touch and the photo with all the great edits. Abagail would love the music and microphone! I have loved VTech for about 22 years, their products are made well and last forever!! I love the variety of Apps & the camera feature! I like that it can connect with a smartphone. Parents and kids can send stuff between. I like it can connect to a smartphone so I can send stuff to my son with it. I like that it would be good for all of my kids to share. There are things they each would like. the camera feature is really cool and the games! I wish you didn't need cartridges still. you don't! That is what the Learning Library is - apps! :) But you CAN for added bonus. I love that you can have connection between the tablet and your phone! That is so cool! I like that it comes with apps but I can also buy extra cartridges. I like the entire thing...and know my granddaughter would too! It also has a camera !!!! Yes !! Best feature ever ! I like that it comes with 20 apps! I love the camera and video! I do love the camera but I also love that it comes preloaded with some pretty great apps! Thank you!! I would love to win this for my son. It is #1 on his Xmas list. He would love the Monsters U app. I like that it comes with apps! I love that it comes preloaded with 20 apps! I like that it can take photos Thank you! This would be a great learning tool for my nephew! Thanks for the chance! I love that it has an e-reader and a camera. I love that it works on wifi, perfect for our house and my twins! A great gift for grandchildren. I love that it takes pictures and videos. My preschooler currently likes to do that with my ipad but I am worried she will break it. It would be wonderful for her to have her own kid friendly devide. I like that it comes with 20 free apps! I love the improved camera feature! I like these features as listed: "Kid-safe internet browser with VTech pre-selected and parent-approved websites and secure Wi-Fi connectivity." I like all the apps! Thanks for the giveaway! The camera! My toddler is constantly taking my phone to snap pictures, she's going to love having her own. I love that you can download more than 350 educational games, e-books, music and videos! Thank you for the fabulous giveaway! I like the wifi and the camera! I love the swivel camera and more importantly, my daughter would really love it! I love that it takes photos and videos. I like that it comes with apps ready for play instead of having to buy more games right away! I love it because it comes ready for the little ones to use and it has a camera. Most kids just love taking pictures. Thanks for this giveaway and your wonderful blog. I love being able to use different cartridges with it, my toddler would absolutely love this! I love the rotating camera, I think my kids would have a blast with it! My kids would love to take pictures with it. Definitely love that the rechargeable battery pack is included and that it has a Micro SD card slot to hold more memory! This would so perfect for my daughter! I really like that this has a Micro SD card for memory expansion. Very useful. That it has a camera is cool as my sister's grandson, who this would be for, is fascinated with cameras and pics, currently. Thanks for the giveaway. i love that it can take pictures! this would make a great gift for my grand son, he loves to take pictures. I love that you can take photos & video with a rotating camera, my kids would love that feature I'm sure. I love that it comes with 20 free apps! I like that you can take pictures and videos. I love that it has wifi and how it can take photos. I love the camera. She loves to take pictures and she is really pretty good. I like the Wonder Cam. I could just see the boys hysterically laughing as they play with photos. With 3 autistic kids, there is always a fight over "my" iPad..siiigh! 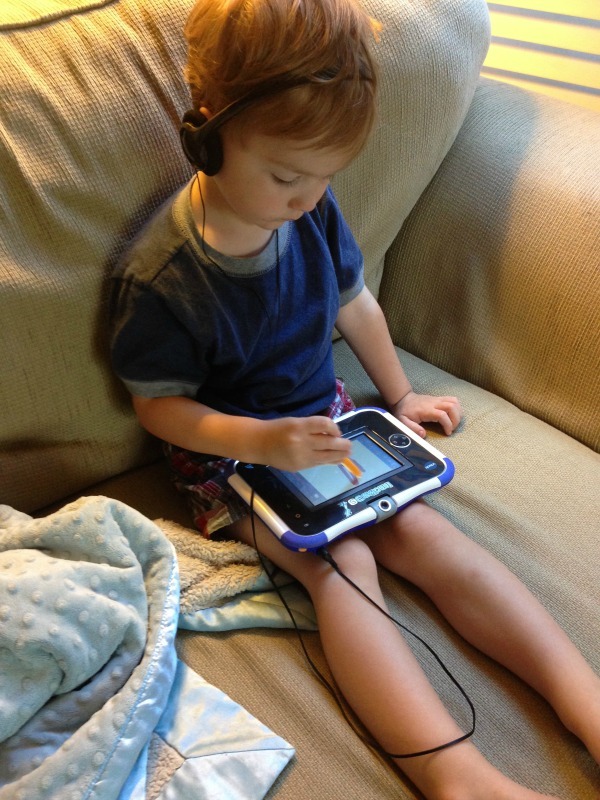 A new tablet form of learning would be such a Great therapy tool for my preschooler! I like that you can send text msgs! I love that it is a camera too! I love the 20 free apps! Oh we would love the E-reader! He loves to be read to and would love the ebooks! Rechargeable batteries are definitely awesome! The 20 free apps plus the affordability make this a great product. I love all the different app options! My girls would have a blast with this. I love that it can take photos. My grandson would love this! I like that it has Wi-Fi capabilities and it is a great learning toy. Love that it's a camera too, my daughter is always wanting to play around with mine. I like that it's a e-reader also! Also love the apps! I like the Kid Connect communication app! I love the Kid Safe Wi-fi and the kids are going to love the WonderCam! They go crazy taking pictures and love having effects to use! Thanks! Thank you for this GREAT giveaway! I love that little people can have fun learning. It is also a great way for them to begin learning computer technology. I have a 3 year old Grandson and he would love this Innotab would be great for him. I like that you can put so many ebooks and apps on it. I love the Connect center so she can keep in touch with me easily! I'd like the rechargeable battery pack. But I'd love that she could play on her own tablet and not mine...lol. I like the pop-up 3D art studio feature. I love that it can be entertaining and educational for my grandkids and they can color as well. I love the idea of getting texts from little ones! I love the connection between the innotab and a parents iphone! I love that it comes with 20 apps already!! I love that it comes with 20 apps already!!!! I love the camera. What a super cool feature. My son would love this!!! My 3 year old has the fist version of the InnoTab and my 5 year old has the InnoTab 2. Both versions are great and it seems with each new version it just gets better and better. This one is fantastic! The 20 preloaded apps, the text messaging (my 5 year old would get a total kick out of that one!) and my favorite feature of all--the rechargeable battery pack! Because man do the 1st and second versions eat through some batteries! Lol. I love that it has a camera, my daughter would definitely get some use out of it! I like the rechargeable battery pack. I love that you can text on it!! Would be nice if we were out to dinner and could message my son while he is at grandpa's. I like the 55 picture effects feature that comes with the camera part of it. I love the new D-pad! I am thinking I just read where it says the child and parent can text with wifi? I love that feature if so. I love that there's a safe connection to my smartphone so I can safely chat with my youngest children. I love that it includes 20 games for my son to play. I like that it is rechargable. I love the camera. My granddaughter is a selfie queen and would love it. I love that it comes with a rechargeable battery pack and adapter. I love the WiFi and the camera. I love the camera as my son loves to take pictures!